Patients in both studies followed a diet low in fibre and FODMAPs for 24 hours and were required to fast overnight prior to each breath test. Participants consumed a drink containing 35g of fructose in 200ml of water for each test and breath samples were collected every 15 or 20 minutes for up to four hours. Study 1 – is a fructose breath test result reproducible? 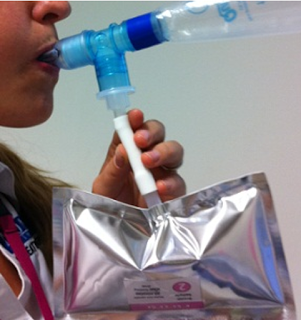 Some study 1 participants had their second breath test performed >19 weeks after the first. This relatively long period of time between tests means that changes in diet or medications may have affected gut bacterial populations and therefore influenced the results. This study included a small number of participants and retrospectively analysed data from existing studies. A larger, prospective study that collects data over a longer test period would be useful to further validate these findings. Study 2 – are symptoms on a breath test related to breath hydrogen response? Gastrointestinal symptom data from study 2 was only collected during the breath-testing period and not the remainder of the day, so may not have captured participants who had a delayed symptom response. Clinical significance – a fructose breath test is not helpful in identifying fructose as a trigger. 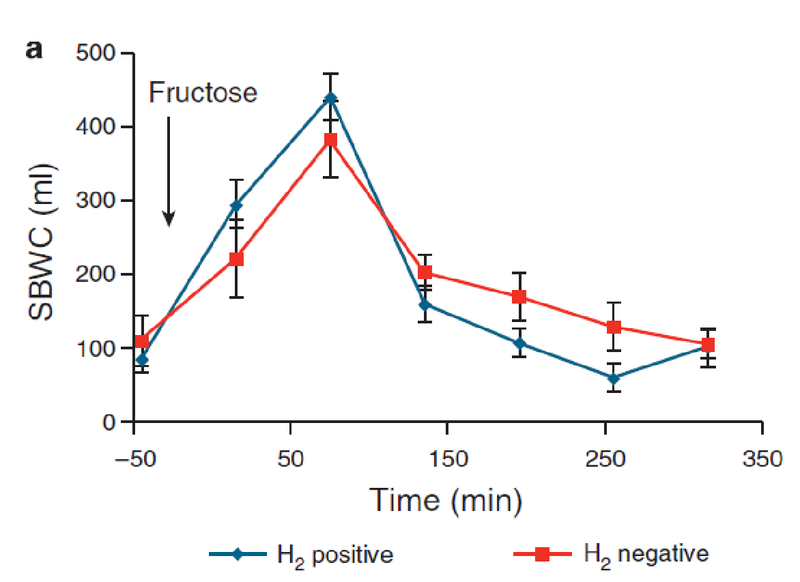 This figure demonstrates the increase in small bowel water content (SBWC) seen on consumption of fructose in individuals with a positive fructose breath test (blue) and a negative fructose breath test (red).2 You can see there is no difference. Fructose increases SBWC regardless of breath test outcomes. The results of this and previous research DO NOT support the use of routine fructose breath tests for the diagnosis of fructose malabsorption or to guide management in people with IBS. Yao CK, Tuck C, Barrett J, Canale K, Philpott H, Gibson P. Reproducibility of lactulose and fructose breath hydrogen testing and impact on clinical utility. Journal of Nutrition & Intermediary Metabolism. 4:29. Murray K, Wilkinson-Smith V, Hoad C, Costigan C, Cox E, Lam C, et al. Differential effects of FODMAPs (fermentable oligo-, di-, mono-saccharides and polyols) on small and large intestinal contents in healthy subjects shown by MRI. The American journal of gastroenterology. 2014;109(1):110-9.